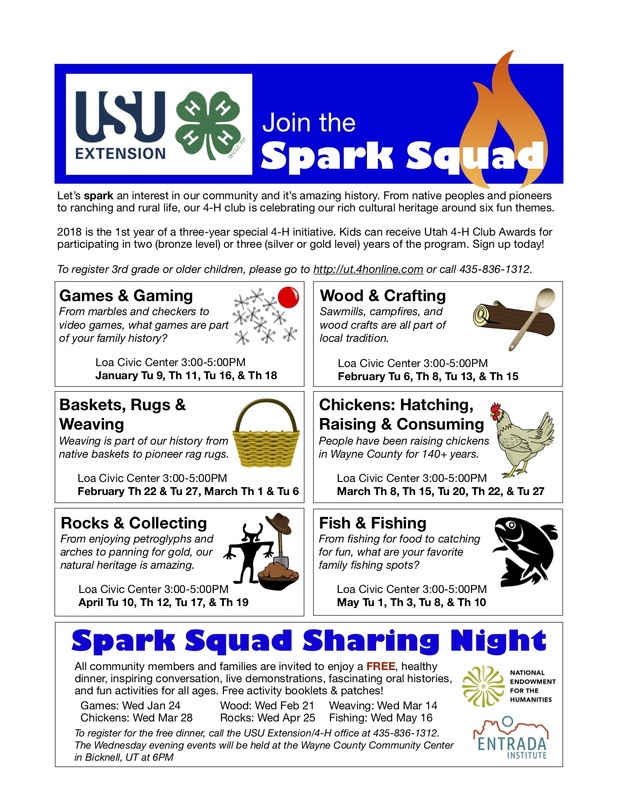 The Sparking Humanities Project ignites conversations about cultural and traditional resources in rural Utah through innovative programs that bring together youth, families, and the local community to celebrate the human experience. To explore the 2018 Season, go to the Spark Squad 2018 page. During the 2018 season, after-school activities and community dinners focused on six themes: games and gaming, wood and crafting, baskets, rugs & weaving, chickens, rocks and collecting, and fish and fishing. To explore the 2018 program, click the poster on the right. 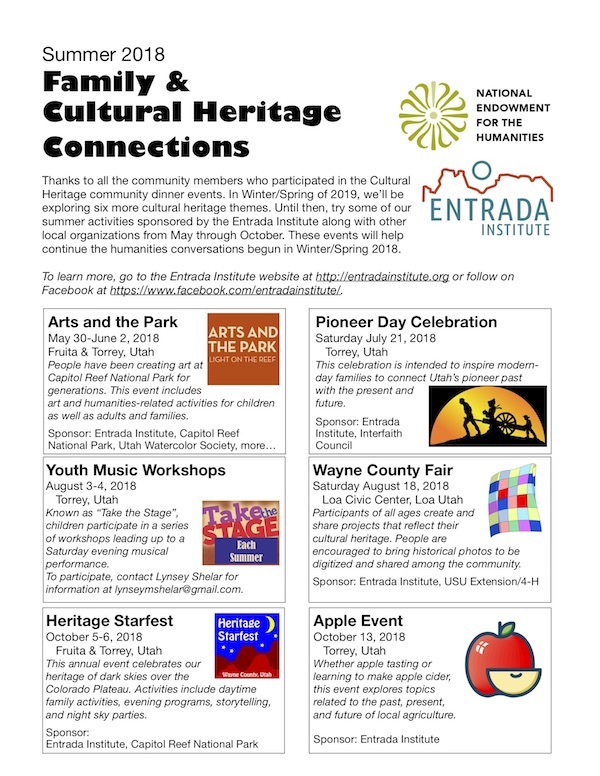 The Entrada Institute along with other local organizations sponsors a series of programs to encourage family humanities conversations through the summer. 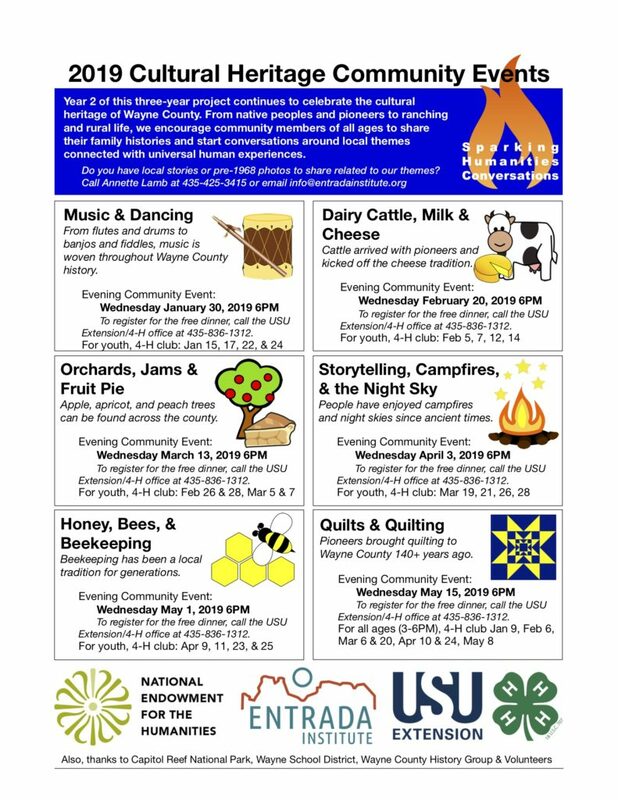 Specifically, look for the following events: Arts and the Park (May 30-June 2), Pioneer Day Celebration (July 21), Youth Music Workshops (August 3-4), Wayne County Fair Cultural Heritage Project (August 18), Heritage Starfest (October 5-6) and the Apple Tasting Event (October 13). To explore the 2018 summer schedule, click the poster on the right. To follow our Facebook page, go to Facebook. 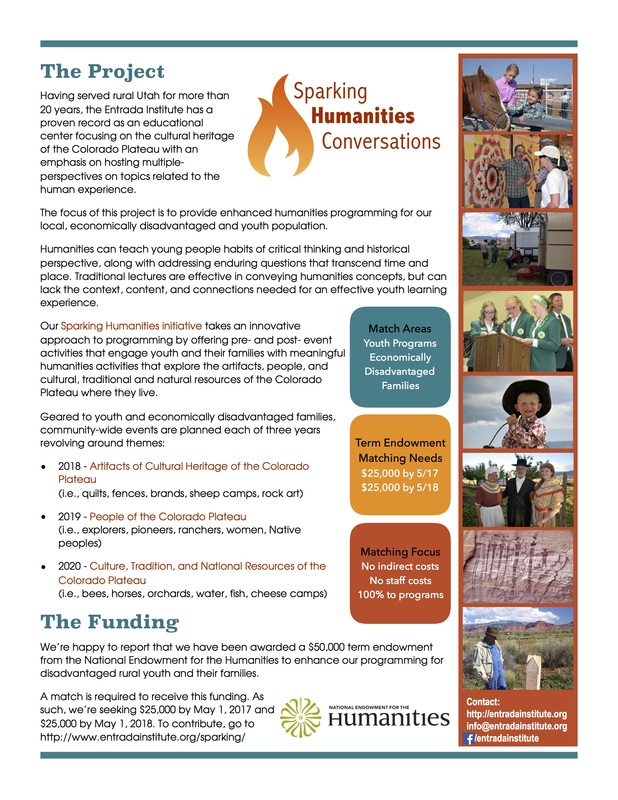 The Entrada Institute is the recipient of a $50,000 Humanities Access grant from the National Endowment for the Humanities to “spark humanities conversations through context and connections in rural Utah”. This Humanities Access grant expands opportunities for families to connect with cultural and traditional resources. According to Entrada Board President and project director Annette Lamb, the Entrada Institute will work with area partners including the Wayne County School District, Wayne County USU Extension and 4-H, Capitol Reef National Park, and local humanities individuals and groups to bring the community together in celebration of the human experience in rural America. Read the National Endowment for the Humanities Official Announcement. The National Foundation on the Arts and the Humanities Act of 1965 created the National Endowment for the Humanities as an independent federal agency, the first grand public investment in American culture. The law identified the need for a national cultural agency that would preserve America’s rich history and cultural heritage, and encourage and support scholarship and innovation in history, archaeology, philosophy, literature, and other humanities disciplines. The Endowment awards grants to top-rated proposals examined by panels of independent, external reviewers. 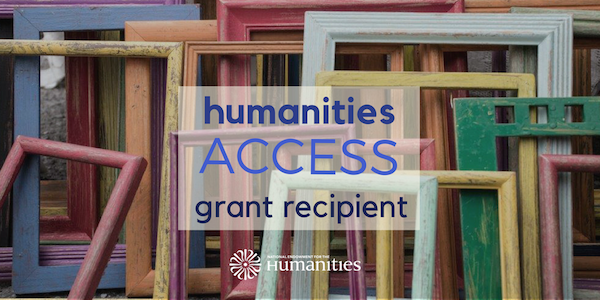 Read the Humanities Access Grant Official Announcement. The Humanities Access Grants are specifically focused on projects that support outstanding cultural programs for young people, communities of color, and economically disadvantaged populations. This term endowment grant requires the nonprofit to raise $50,000 in non-federal, third party donations for a total of $100,000 in project funds. To learn more about the project, go to an overview. Do you prefer a visual overview? Go to the infographic.